October is Breast Cancer Awareness month. This is a very deadly and dangerous disease, and we have an important local charity supporting the cause right here in Kuwait. All of us have been affected by cancer, we have all seen a dear friend or family member fight or die from this dreadful disease. If you were lucky enough to have not been personally affected by it; then please remember the ones who did. Please remember our dear fellow blogger, Four Mee, whom was sadly diagnosed with cancer on her birthday this year, and is bravely fighting this deadly battle. Please show your support and be a part of this very important cause. See you at Kuwait Towers Tonight! Older related posts are here and here. Sorry to hear that your not well. The photo looks beautiful, I have never been to Kuwait, it’s a long way from Australia, so I’m afraid I won’t see you there, but my thoughts are with you. Thank you so much for ur lovely words. It’s not me who’s sick, it’s a friend blogger. You can check her blog here. 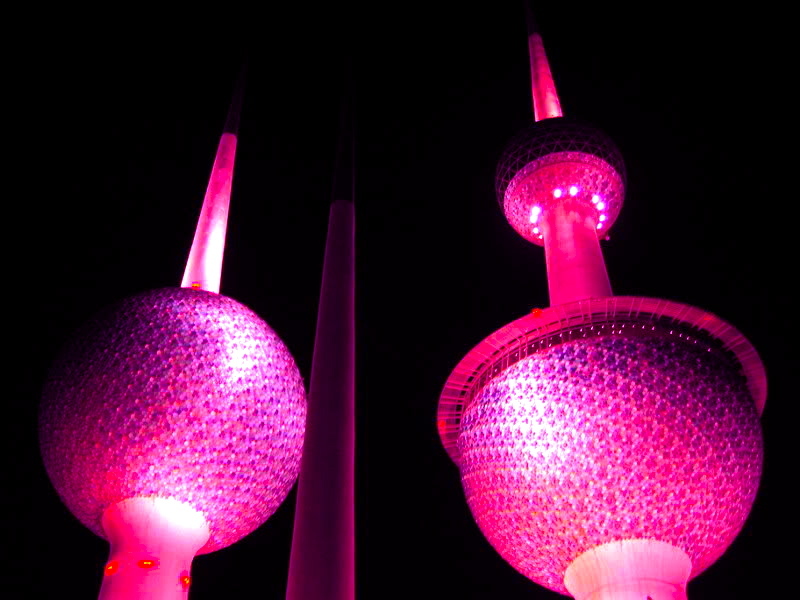 Kuwait Towers is like the Sydney Opera House, so turning it Pink for Breast Cancer Awareness month is a huge thing here. It’s a terrible thing cancer, unfortunately over the years I have lost 2 friends to cancer, it just makes you feel so helpless. I should imagine it wasn’t easy turning the towers pink, but whatever they did, it worked beautifully, a job well done. The turning the towers pink is tonight. I just played with the hue of an old pic of the towers. But still, it’s a big deal to turn them pink. They are the national symbol of or country. Thank u again for ur kindness.